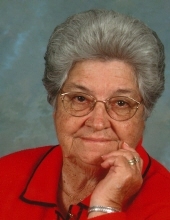 Irene Adams Lamb, 86, of Crab Orchard, KY, passed away Friday, January 18th 2019 at her home. She was the wife of James Lamb, Jr. They entered into Holy Matrimony on October 24, 1954 and have been blessed with 64 years of marriage. Irene was born in Garrard County, Kentucky on September 16, 1932, a daughter of the late Fannie (Helton) and Johnnie Adams. She was a member of the Lancaster Church of God. She had previously worked as a seamstress at Palm Beach for 25 Years. She truly enjoyed setting up at the Stanford Flea Market for over 10 years. She was a loving wife, mother, grandmother and sister. She never met a stranger and was blessed with a multitude of friends and neighbors. Visitation will be held after 5 PM Monday, January 21, 2019 at McKnight Funeral Home. To send flowers or a remembrance gift to the family of Irene Adams Lamb, please visit our Tribute Store. "Email Address" would like to share the life celebration of Irene Adams Lamb. Click on the "link" to go to share a favorite memory or leave a condolence message for the family.